Increase your beginning teachers' chances for success with this comprehensive training package, based on Julia Thompson's bestselling book for new teachers. Dubbed a "mentor in a book," The First-Year Teacher's Survival Guide has helped more than 100,000 new teachers create a positive and dynamic learning environment for their students while meeting the challenges of each school day. The accompanying Facilitator's Manual offers a treasure trove for staff developers: a selection of workshop agendas for each video module (to fit a one-day workshop or ongoing training); insightful discussion questions to ensure lively workshops; suggestions for further reading on each topic; and a plethora of free downloadable forms to keep new teachers organized. Also included is a wealth of tips to ensure workshops stay engaging and productive. With this comprehensive training package, schools and districts can get an effective teacher induction program up and running for a fraction of the cost of hiring an outside trainer. Almost every new teacher begins the school year with the same intense mixture of emotions—excitement and worries about the year ahead. While it is satisfying to dream of making a difference in the lives of students, the responsibilities of meeting high standards of professional development, creating a positive classroom environment, and promoting student achievement and learning can also be daunting. It’s not surprising that new teachers can feel overwhelmed and unsure of themselves. Professional development leaders often find that new teachers need confidence-building inspiration and assistance in establishing professional priorities as well as practical advice and guidance. Focused on three key professional responsibilities, the goal The First-Year Teacher’s Survival Guide Professional Development Kit is to help professional development leaders and new teachers work together to make those first years ones in which teachers learn how to skillfully manage the demands of their new career. The result? Knowledgeable, enthusiastic novice teachers with well-managed classrooms where successful students and high achievement are the norm. Divided into seven modules, the kit offers a combination of practical advice, sound pedagogy, research-based solutions, and classroom-tested strategies. Each module explores a key concept necessary for a successful classroom. Accompanying the DVD itself, professional development leaders can also access and use the discussion questions and downloadable handouts for each module. The materials accompanying the DVD have been designed to enhance the information in each module through a combination of discussion, reflection, self-assessment, and useful classroom materials. The First-Year Teacher’s Survival Guide Professional Development Kit is designed to be a working resource that is as flexible as possible—allowing professional development leaders to adjust the way they use it to meet the needs of their new teachers. For example, teacher trainers may choose to have large groups view each module, before breaking into smaller discussion and work groups. The discussion questions can be used as shared brainstorming or individual reflections while the downloadable handouts can be used for the entire group or tailored to meet the needs of specific teachers. Additionally, the DVD, discussion questions, and downloadable handouts can be used in a year-long professional development program as well as during beginning-of-the-year meetings. 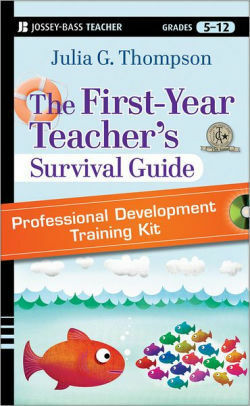 Although the most effective treatment of this resource depends of the needs of the trainers who use it, the ultimate objective of The First-Year Teacher’s Survival Guide professional Development Training Kit is to make it easier for novice teachers to achieve their idealistic dreams of establishing a harmonious classroom where well-behaved and engaged students work towards becoming life-long learners. In turn, the realization of those idealistic dreams will result in stronger, effective, and more satisfying schools for all of us.